RJ Power Rail delivers the design, installation and commissioning of new and modified Principal Supply Points (PSP’s), Auxiliary Supply Points (ASP’s), Functional Supply Points (FSP’s) and 650V Signalling Power Distribution Feeders with Auto Reconfiguration Systems. Principle Supply Points (PSP’s) and Auxiliary Supply Points (ASP’s) – from the supply, delivery, installation and commissioning of new containerised PSP’s, we can manage the life cycle of the project through early engagement at the design phase. We also work with the manufactures to provide the most appropriate plant and switchgear in order to provide a safe and secure signalling power supply to the track side equipment. Functional Supply Points (FSP) – we provide a fully managed service for the installation and commissioning of new FSP’s and provide a modification service for existing FSP’s to maximise the efficiency of the newer, safer Functional Supply Points, in order to remove ‘touch potential’ dangers. When faced with non-compliant housing’s products, we can complete work to these to make them SIN119 compliant. 650v Signalling Power Distribution Feeders – we install all types and sizes of 650v Signal Power Cables over varying distances. 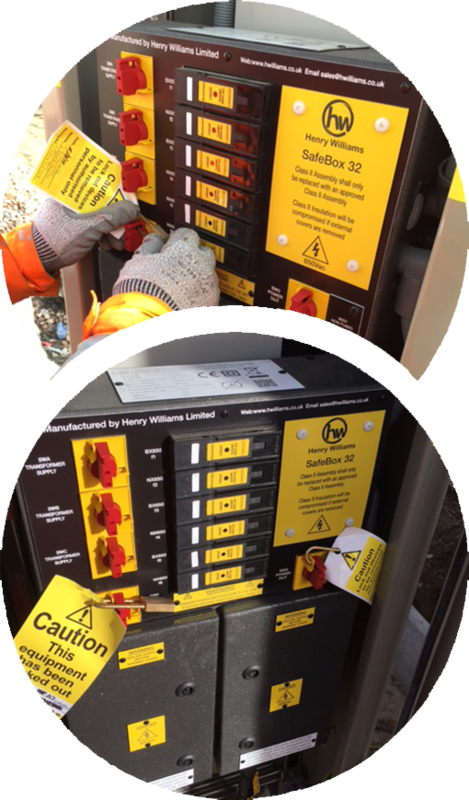 Terminations to trackside equipment and full dead testing is carried out by our testing engineers prior to commissioning.